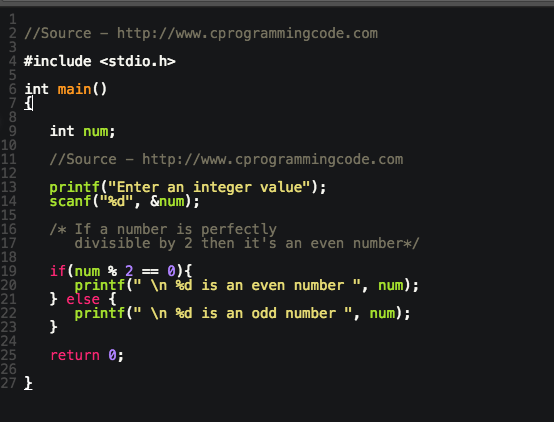 Write a Program to check whether a number is even or odd. Given an input number, we have to write a code to check whether an input number is even or odd. Before solving this problem, let's first understand what is even or odd number? Any integer that can be perfectly divisible by 2 is an even number. For example - 2, 4, 6, 8, 10 etc. An odd number is a number that is not divisible by 2. For example - 3, 5, 7 etc. 1. Declare a variable num (You can declare any variable). 2. Take an input number from user and store this value in num variable. 3. Check whether a number is perfectly divisible by 2 .If it is divisible by 2 then it's a even number otherwise it is an odd number.